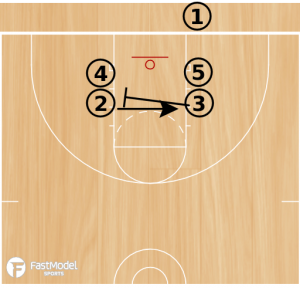 Sharing an idea for a baseline inbounds play to run against man to man defense. Regardless of the inbound play that is being run, the play begins as soon as the inbounder receives the ball from the official. Slapping the ball, yelling “go,” or using any other way to signal the start of the play wastes time on the five second count. It is worth mentioning, that just like any inbound play, or any type of play you run, your players must be sound in screening, cutting, passing, catching, and faking for the play to succeed. The numbers are for identification purposes only. 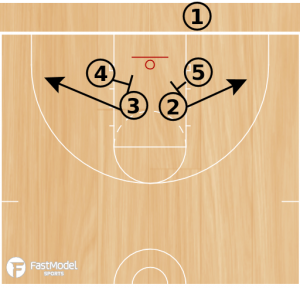 You do not need players that fit the stereotypical 1 through 5 positions to run the play. Always inbound the ball to the first open player to minimize the risk of a five second count. 4 screens for 3. This is the first screen the screener for this play. You can have 2 break beyond the 3 point or inside it. 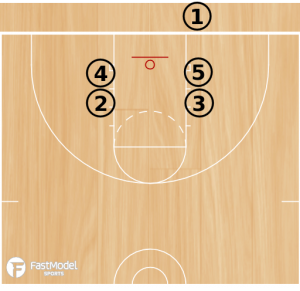 4 screens for 5 and then opens to the ball (or 5 can screen for 4 if you prefer). 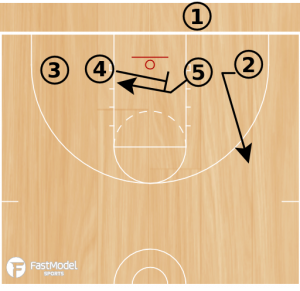 Second STS for this play. 2 breaks out as safety release. You can also consider have the player who ends up in front of the ball release to the elbow for your inbounds pass.